Professor Paul Gough, RMIT Pro Vice-Chancellor Design and Social Context and Vice-President; Martin Foley, Victorian Housing, Disability and Ageing Minister; Martin Bean CBE, RMIT Vice-Chancellor and President; Emma King, VCOSS CEO; Professor David Hayward, Dean of RMIT's School of Global, Urban and Social Studies; ‎Vicki Sutton, Melbourne City Mission CEO. empower not for profits to reorient to a global market. Victoria’s Housing, Disability and Ageing Minister Martin Foley described the NDIS as a “once-in-a-generation opportunity” to transform the lives of Victorians with disability, their families and carers. “This plan is about getting the disability workforce ready for the NDIS and laying the foundations needed to build the workforce of the future,” Foley said. VCOSS CEO Emma King said, with the support and input of Victoria’s community sector, the institute would capitalise on global trends. “A tidal wave of change is about to hit the social services sector,” King said. 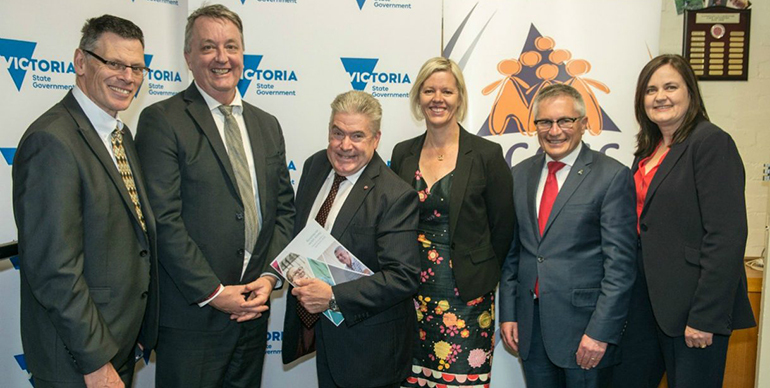 RMIT vice-chancellor and president Martin Bean CBE said the university was proud to help lead Victoria’s innovative response to the social service sector’s biggest challenges, drawing on its experience of collaborating with local and global industry networks to drive employment and innovation outcomes. “RMIT doesn’t just equip social service students with the knowledge and skills needed by the sector, the university’s research also supports the development of creative solutions to complex social issues,” Bean said.